A new flag is flying over the farm this week. Forty-nine years ago, when Canada was deciding what its national flag should look like, this was one of the options. Prime Minister Lester Pearson put out a call to Canadians, asking for them to submit ideas for a Canadian flag. 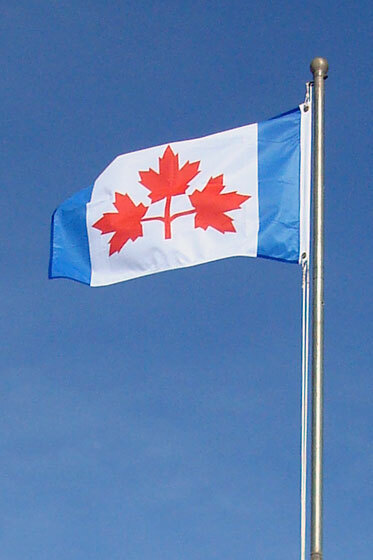 Pearson’s own suggestion was for a flag with three red maple leaves bordered with blue bars on either edge–symbolizing Canada’s position as a sea-to-sea nation. Artist Alan Brookman Beddoe drew the actual design, which came to be known as the Pearson Pennant. Throughout 1964, the government and citizens debated what was the best design for our flag. 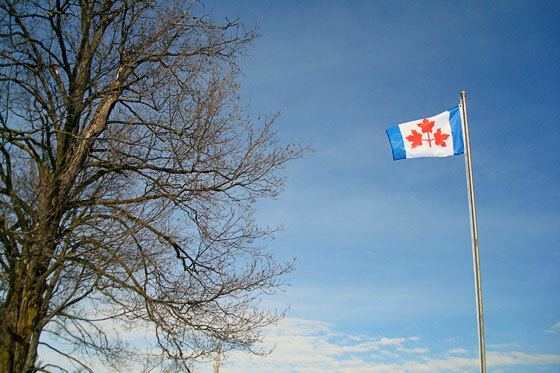 Eventually a submission from two men, George Stanley and John Matheson, was chosen as Canada’s official flag. Today, their design of a single red maple leaf between two red bars has become an iconic image, and the Pearson Pennant has become historical reference. Feb. 15, 1965 is Flag Day in Canada, the first time the maple leaf flew as our nation’s official flag. While it seems a bit backwards, this week we’re commemorating the flag debate by flying the Pearson Pennant. As a history buff, Matt has a special affection for the Pearson Pennant. For his birthday last year, I had one made for him, knowing that we’d soon have a flagpole and be able to fly it ourselves. We’ll go back to the maple leaf soon enough, but for this week I don’t mind a little history lesson. Thanks to Matt for helping to write this post. Happy Flag Day everyone. Cool in a slightly geeky way, IMO. 🙂 Nice to hear from you. Hope you, Brandy and the boys are doing well. Happy Flag Day and enjoy your Family Day long weekend! But geeky is the new cool, nowadays. Why, if I’d have been born 10 years later, I’d be the coolest guy around! Geeky? Whatever… You know it’s cool. Wow! I had no idea. I like the sea-to-sea thing. It would have been nice to have the single maple leaf between two blue bars. (Would make the Canada day mob scene a bit less monochromatic…) Thanks for an interesting bit of history!